Download the free Introduction to walking bass lines ebook. Examples from the 5 book Constructing Walking Jazz Bass Lines series. Building a 12 key facility for the jazz bassist. 10 classic jazz standard chord progressions in 12 keys with fully written out bass lines. Classic bebop walking bass line from Constructing Walking Jazz Bass Lines Book IV Building a 12 key facility for the jazz bassist. Listening to a great jazz bass player walking bass lines was the defining moment for me. Once I heard that sound, I knew that was what I was going to do. The record was Giant Steps and the bassist was Paul Chambers. Like many bass players, once they’re exposed to jazz thats what they want to do.The aim of our site is to make available the information to get bass players to that point. Like all good teachers, my first recommendation is to listen to as much music as you can. Listen to great bass players. Theres an endless list. Milt Hinton, Jimmy Blanton, Slam Stewart, Percy Heath, Doug Watkins, Paul Chambers, Wilbur Ware, Ron Carter, Ray Brown, Herbie Lewis. Take the time to absorb the music and find out who the bass player is on the record date. Chances are that if your just starting out listening to records you will tune in to a particular style of walking bass player. Theres a big difference between Wilbur Ware and Paul Chambers.What is it that sets them apart ? They both play great and played with many of the same musicians of the time. The more you listen, and the more experience you gain, the easier it is to define the differences. Transcribing records is another important aspect of playing walking bass lines. As any good teacher will tell you. Pick out your favorite bass line or bass player and sit down and try to work it out. In the beginning it can be slow, but like all things with practice it gets easier. The thing about transcribing is it develops many aspects of your playing at the same time.It develops your walking bass line vocabulary. It strengthens your technique, and it is great for your ear. Being able to hear root movement and recognize chord sequences is a very important skill to develop. Walking Bass Line example from Book III Standard Lines. Sample walking bass line on Classic jazz standard chord progression Taken from Constructing Walking Jazz Bass Lines Book III Standard Lines. When first starting out trying to learn to play jazz or walking bass lines it can be hard to know where to start. If you can find a teacher, your off to a good start. Chances are they have already listened to and experienced most of what you are trying to learn. A good teacher can help you with jazz harmony , learning to play the instrument and guide you in some great albums to listen to. The good thing about listening to great records is playing along with them. This brings us back to transcribing. Work out a small section of bass line and then play along with the record. 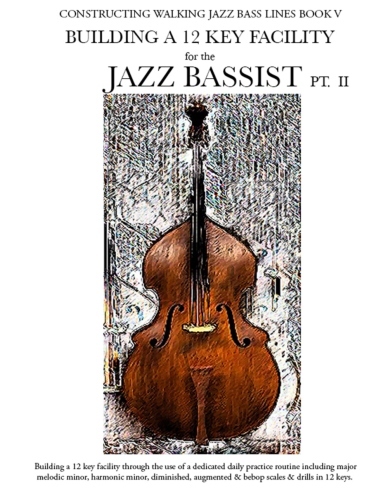 Jazz method books or walking bass line books can also be a great resource for learning to play jazz. When I was first starting out on Upright bass I studied with a teacher and worked out of Simandl (the Bible for upright players. I also studied out of jazz harmony books as well as the Ray Brown Book. Since then I have written many of my own books that each work on a different aspect of walking bass line techniques and jazz harmony. All books are available in either standard notation or bass tab. Having the bass tab option is for the bass guitar player and will hopefully inspire them to read standard notation. Being able to read music can open doors. If your looking for a good teacher and there isn’t one in your area, contact me. I Teach lessons online and have taught people from all over the world using that system. I studied with Charles Banacos using that style of teaching, Charlie was in Boston and I was in New York at the time. We sent lessons to each other.